Subscription boxes are the rage lately. I subscribe to one for beauty products and my mom has one for health and wellness products. I recently learned about Nerd Block, a mystery subscription box for “geeks” and “nerds”. They are Canadian based, but ship to many countries around the world including the USA. Each month they send their subscribers a “Block” – a box filled with toys, collectables and a custom t-shirt. They’ve grown leaps and bounds since their launch in 2013 and now have a subscriber base in the tens of thousands. As soon as I checked out their site, I knew right away that my “nerd”, John, would flip out over a subscription. 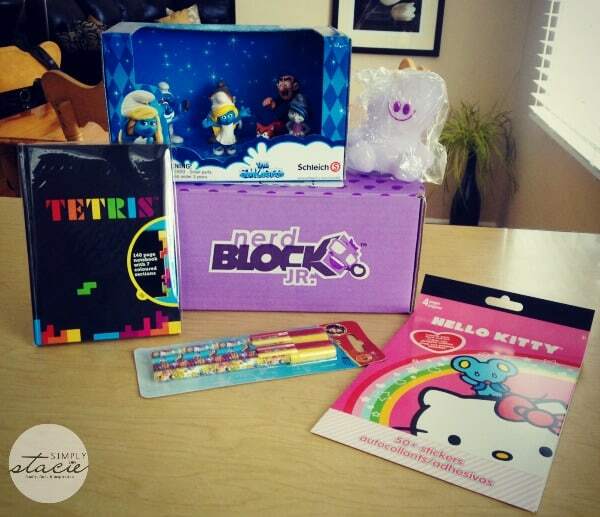 Now kids can get their own subcription box each month with Nerd Block Jr – a Nerd Block subscription geared for kids featuring age appropriate toys. My daughter, Bridget, loves to get mail and would be thrilled to have her own special monthly delivery. Check out this introductory video on how it works! Choose between a Nerd Block Jr. subscription for either a boy or girl. I picked the one for girls for my 10 year old daughter, Bridget. Nerd Block Jr. is geared towards children ages 6 to 11. 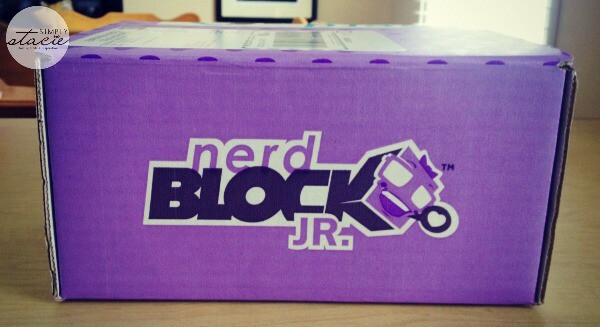 Our purple Nerd Block Jr. “block” arrived in the mail and I told Bridget she could open it up to see what was inside. Unlike the regular Nerd Block subscription, there is no t-shirt inside making room for more toys! 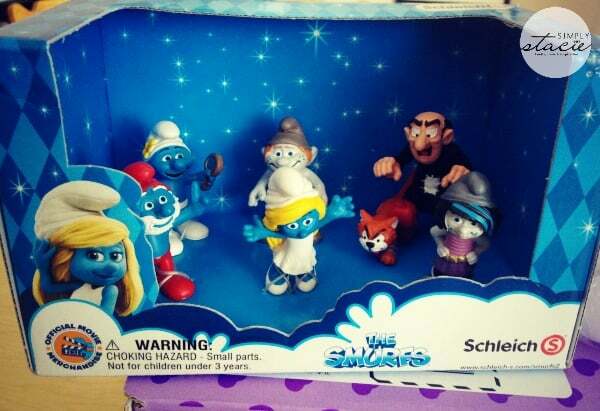 The kid in me was excited to see these Smurf figurines! I used to watch the cartoon every Saturday morning as a child. John was trying to take it for his collection, but I told him it belonged to Bridget! Do you remember all the characters names? 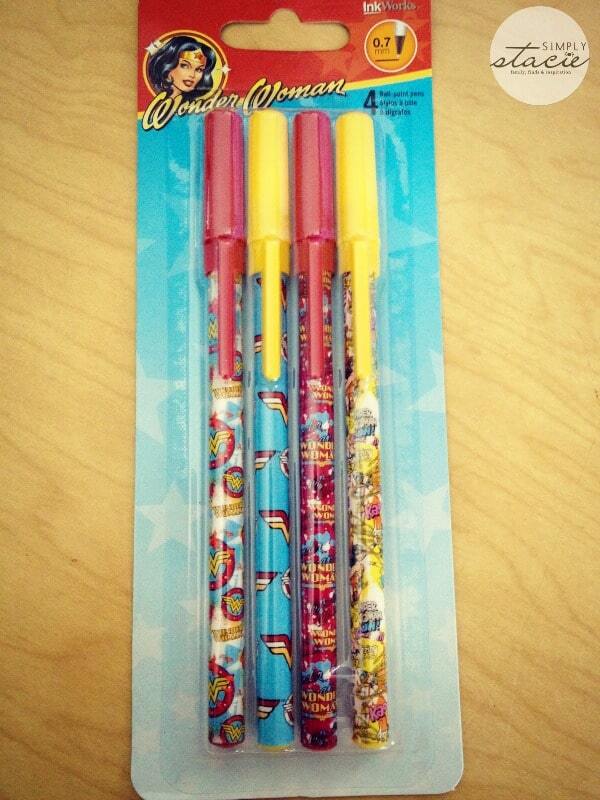 Inside was also this set of Wonder Woman pens and a Tetris notebook. Bridget thought all the toys were “cool” and quickly took them away to her room to check them all out. A subscription to Nerd Block Jr. is $13.99 a month paid either by VISA or MasterCard. You can also get a cheaper monthly rate if you prepay for a longer period of time. For instance, their most popular plan is for 6 months at a cost of $11.89/month. If you want to try it out first, go with the month by month plan. Then if you decide that you like it, buy one of the longer plans and save a bit each month. Another perk of picking one of the bigger plans is that you can also pay via Paypal in addition to credit cards. Looking for a last minute gift for a child? Buy them a unique gift – a Nerd Block Jr. Subscription! Use the coupon code PRESENT to save 10% on your first month.